The Episcopal Diocese of Texas interviewed Colleen at the Church’s General Convention this August, 2018. Today, her work circles the Anglican Communion. Her cutwork stoles embody a response to the environmental degradation she sees around her and others hold very personal icons for the wearer. The video from the interview can be watched below, enjoy! 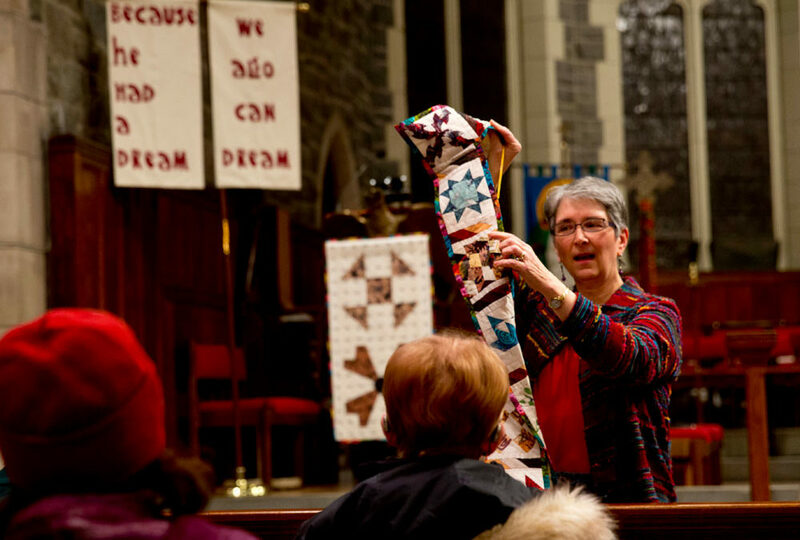 Here I am in my church, the Church of the Redeemer in Morristown, New Jersey telling the story of the Secret Quilt Code of the Underground Railroad as we begin the Season of Reconciliation. You may be asking what season is that?!? It began at Redeemer back in 2000 when the racial dialogue group came to the worship committee saying “racism is alive and well in the United States of America and what is Redeemer going to do about it?” The worship committee took the challenge seriously and began a journey that would lead us to an amazing liturgy using some of the models of the Peace and Reconciliation movement going on under the guidance of Bishop Desmond Tutu and Nelson Mandela in South Africa (for more go to www.redeemermorristown.org). We set aside the time between Martin Luther King Jr. Sunday and Absalom Jones Sunday to seriously answer the challenge set forth. 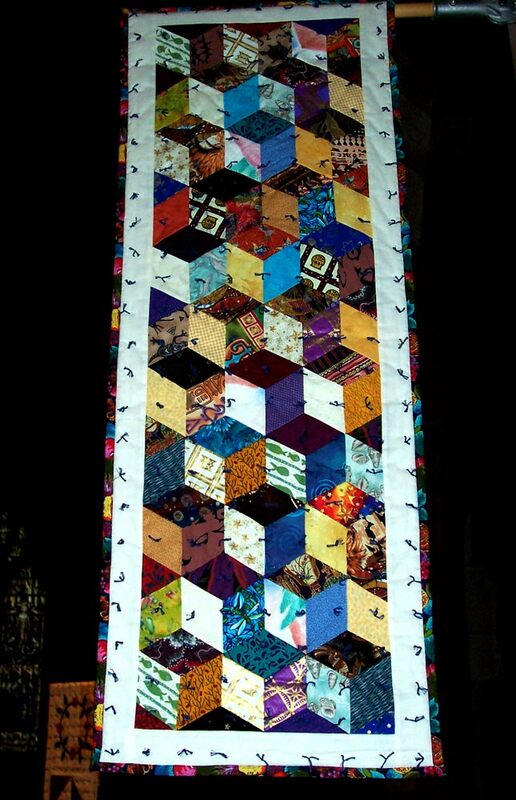 There are those who reject the quilt code claiming it is a falsehood concocted to sell the book. As an oral tradition, I doubt it is all 100% true but I also believe it to be 100% real. The very first time I told the story was at Redeemer. I couldn’t see the choir but after the service, one member stopped me exclaiming, “I knew it, I knew it, I knew it!! !” When I asked him what he knew, he told me the story of growing up in a three generation household in the projects. He told of a young white teacher who came to his school and taught the children Black history. He told of being so excited he went home to tell his grandmother… and she told him the story of the secret code she had learned at her mother’s knees. So much so, that as I said the code, Michael joined in. 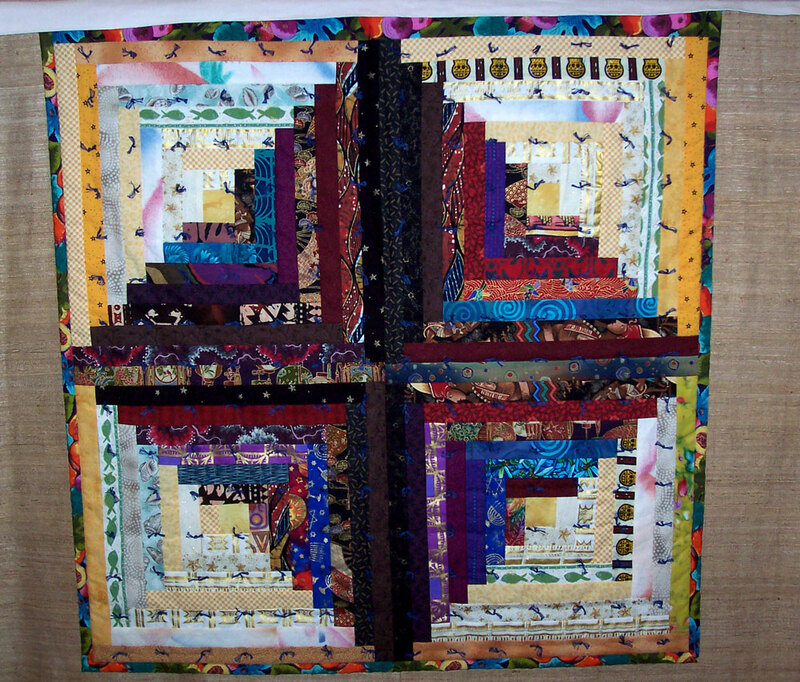 Next is the “fifth knot of the tenth block” also known as tumbling blocks. 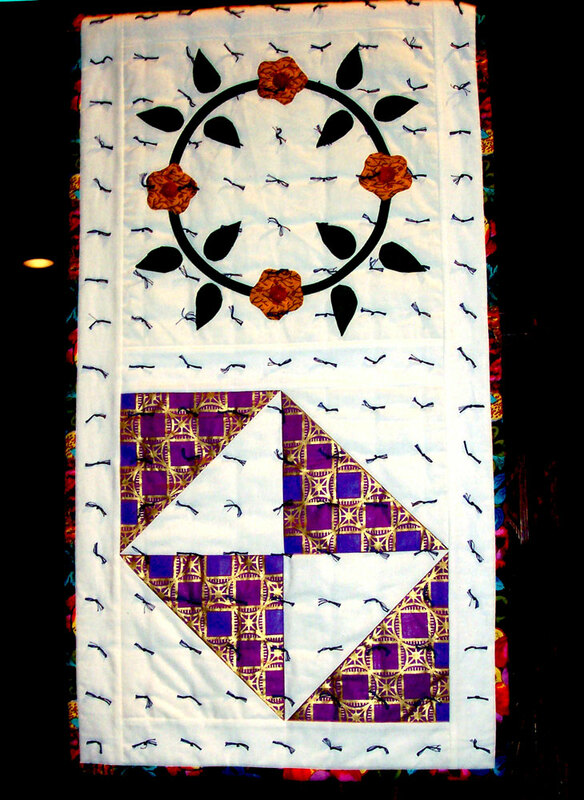 It is written this quilt would go up on the plantation on the day of the night you were supposed to run. Five knots ritually tied invoked the power of the ancestors for protection on the journey. So, the fifth knot reminded them they did not go alone but would be joined in spirit by all those they had loved and lost. And, finally, here are broken dishes and flower wreaths. In some African traditions, when someone dies, you weave a wreath of flowers to leave on the grave. When you visit the grave, you leave a piece of broken pottery. It is written flower wreaths or broken dishes would be left along the trail to honor those who did not survive the journey. At Redeemer, we place this piece on the pulpit to honor all those who gave their lives that others might be free; Martin Luther King, Jr., Steven Bieko, Matthew Shepherd, Oscar Romero and so many more both known and unknown through the ages. The fabrics selected for these pieces were collected from around the world and include Aboriginal, African, European, Indian and American textiles. The images include Native American Spirit Guides, the Star of David, Christian symbols and so much more. The five shades of humanity as defined by Native American tradition are also included; red, brown, black, yellow and white. Importantly, the fabric that binds each of the pieces together is made up of a single piece that includes all five shades of humanity plus every color of the rainbow to say clearly we are all one and together, we create a wondrously beautiful mosaic. This year, I find the liturgy even more meaningful as we maneuver through the ups and downs of the first days of our new presidency. I hear Scripture calling me to clothe the naked and feed the hungry and care for the sick and the homeless; but that is not what I hear from my own government. The hope I hold on to in these days is of Jesus and his courageous example and determination to make his world a better place. May we all work to do the same in this day and this nation. One of the blocks not pictured here is Crossroads. It was a message to the slaves that they were at a crossroads and needed to decide would they run for freedom or stay in captivity? It seems to me we, too, are at a crossroads… what will you do? One might say OUCH right about now. I assure you I did! 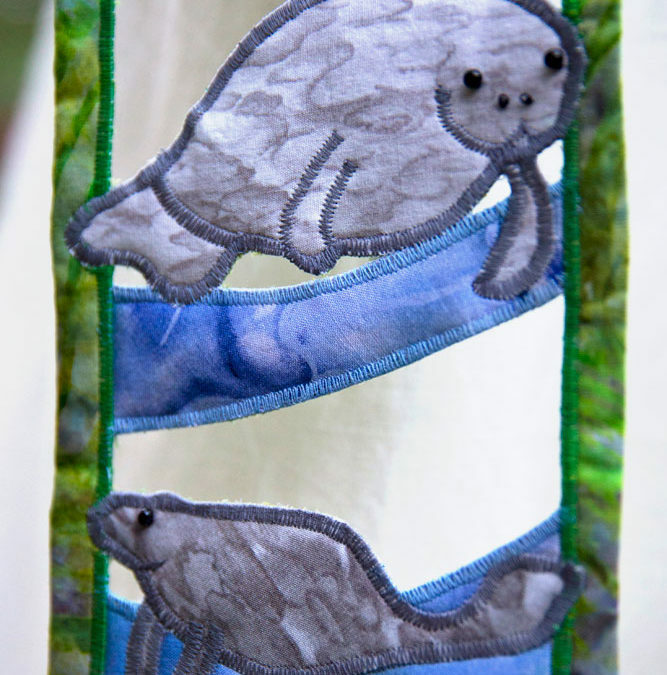 I was working hard on an Easter banner to have it ready in time when my finger zigged as it should have zagged guiding the fabric through my machine and the needle pierced it through!!! 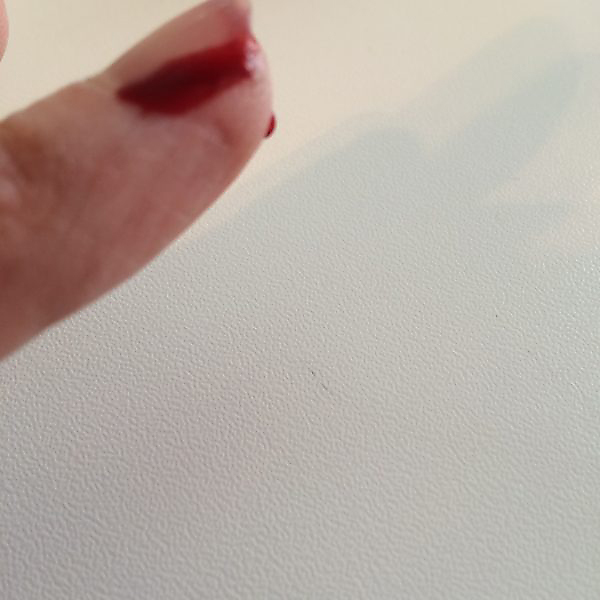 It hurt a LOT and there was blood everywhere but, gratefully, not a drop on the white Easter Banner, thanks be to God! I’ve been thinking a lot about him this past week – of our visits and long phone conversations and of his life. 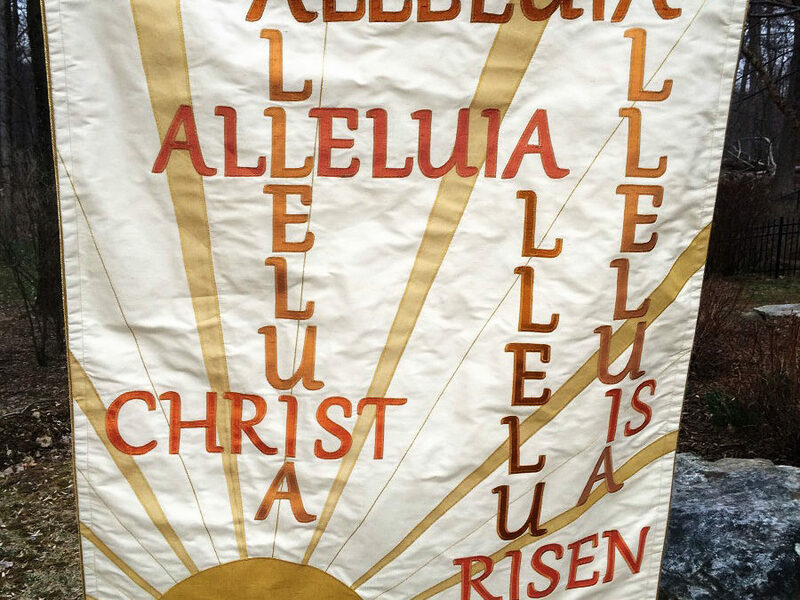 I’ve also been working on an Easter Alleluia banner, and as I pierced my finger with my sewing machine needle and gave thanks I hadn’t bled all over it got me to thinking that even in the blood and pain of life, there’s a reason to say alleluia. And that’s exactly what my friend taught me. His life was not always an easy one. He lost one of his beloved sons and still managed to find the light in that darkness knowing he was at peace. Even in the midst of his heart attack and surgery, he said alleluia that he was still alive. Even in the horror of his stroke and the tremendous difficulty returning, he managed to sing alleluia with each small triumph. As his life twisted and turned and new challenges arose, he managed to find the alleluias as he connected with those he loved in new ways – by always responding to Facebook posts with joy, by calling and writing and visiting whenever he could. He so enjoyed his visits with friends and family by air and rail. The trips exhausted and exhilarated him as he reconnected with those he loved and shared the alleluia moments. He found alleluias in his cat and his beloved rescue dog. Some of his best alleluias were his beloved sons and their wives and his grandchildren. 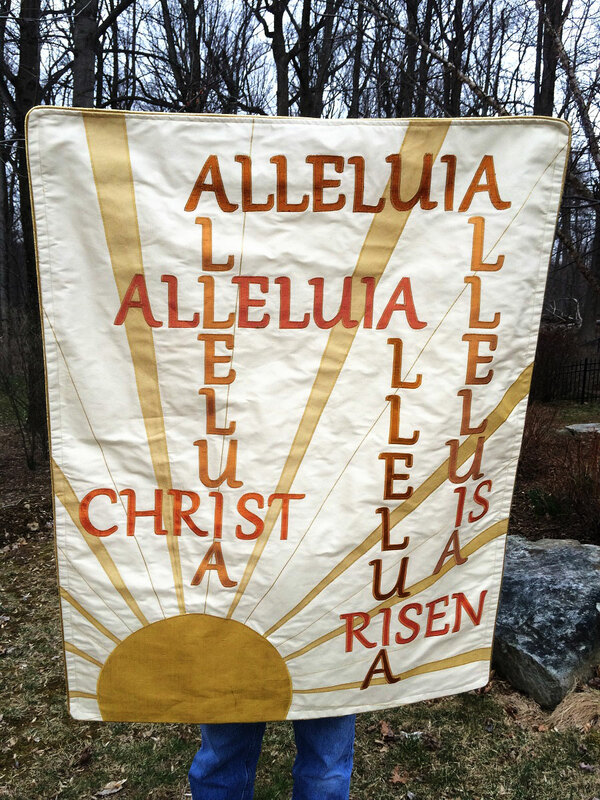 And so it is that as I look at this joyous Easter Banner, I know that it came at a cost. Jesus gave his life that we might live. It’s at the same time so simple and so profound. May we all find our Alleluias. A few days later, he approached me and asked what it looked like now. And so it began; every so many days, we would talk and I would continue to draw in the air and the images coalesced into what would be a complete set for him. Having gotten that all figured out, I knew I wanted to use some fabrics from the Holy Land in the design. We were on a very tight experiential trip with little time for shopping but our guide knew I was after fabric. 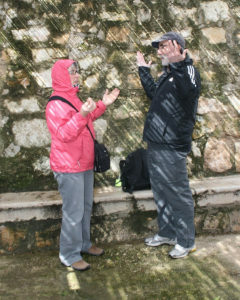 On our final day in Jerusalem, we had about two hours to wander. Graciously, he pointed out some shops for me so, when the day’s tour was over, off I went to gather the fabric. It was to be a most harrowing experience! Let’s just say Old City Jerusalem would not pass most electrical or fire code inspections. The shop I went to had all their silk fabrics upstairs. The stairs were very steep, had no railing and were lined with tubes of fabrics precariously stacked against the wall making for a very narrow passage. Once upstairs, there were bolts of fabric stacked to the top of the 12 foot ceiling everywhere. 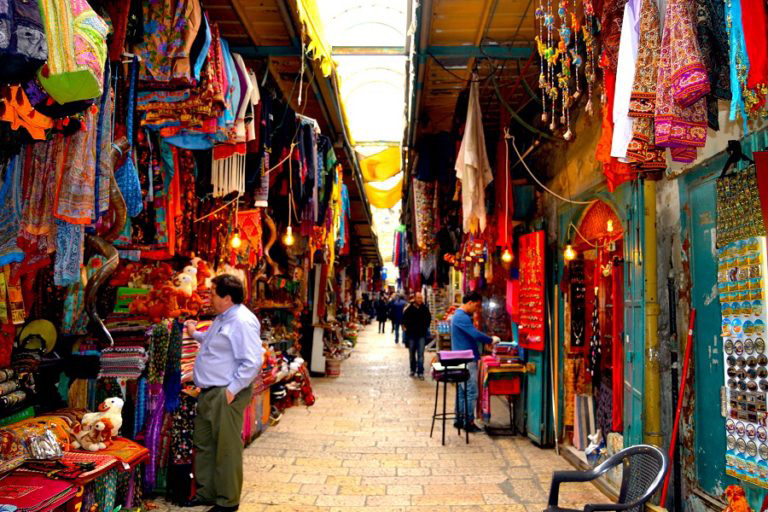 The shop keeper spoke Arabic, I spoke English, a friend had brought along an intern he was working with who spoke some Hebrew. The shop keeper spoke enough Hebrew to communicate with the intern who translated for me… but he kept showing me polyester and I kept saying no polyester. He finally understood what I meant and brought out some beautiful silk/cotton blends. To prove they were not polyester, he took out his lighter (Polyester will catch on fire whereas silk will just singe the edges) and proceeded to show me. I grabbed the lighter saying yes, I know and praying no sparks would fly as I imagined the headlines back home saying “Members of the Diocesan trip to the Holy Land found dead in Old City fire.” Thankfully, that was not to be, I got some absolutely beautiful silk moiré fabrics that found their way into the set and all was well! We moved to Baton Rouge LA in early 1980 and began the search for our church home. 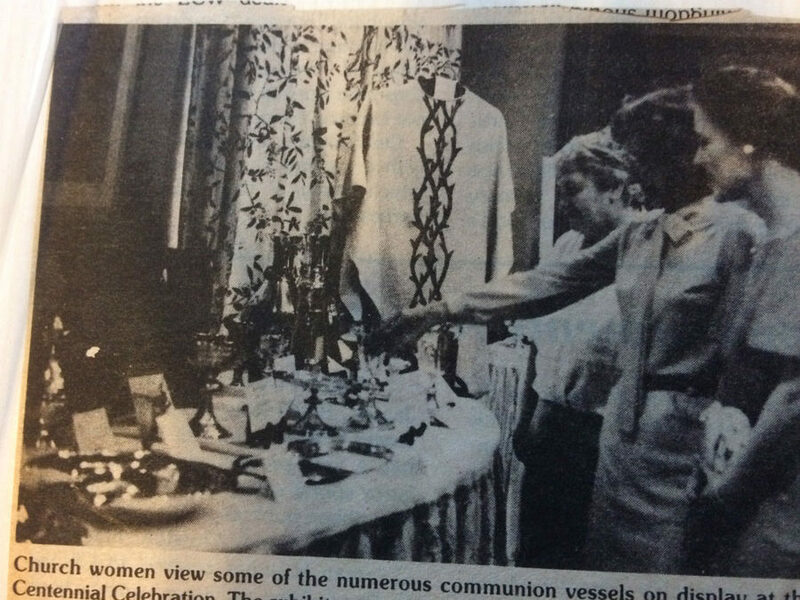 Having come from Michigan, it was quite a challenge as the norm in Louisiana was for the children to be in Sunday School until they were 13 at which time they were Confirmed, given their First Communion and expected to sit in church. 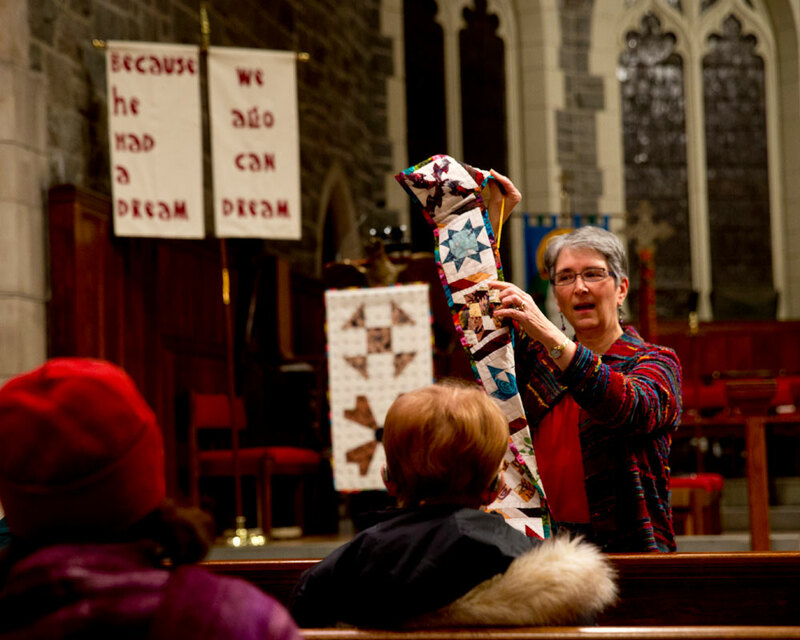 For our 1 and 6 year olds, the norm had been to be active participants in worship. After many an awkward visit to various churches throughout Baton Rouge, a neighbor suggested perhaps we would enjoy St. Margaret’s Episcopal Church, the new mission in town. The following Sunday was the start of Lent. Our one year old was ill so I took our son to investigate. They had built their parish hall first and were worshiping there with gold shag carpeting beneath the altar and folding chairs. The Spirit was alive and I can still see Fr. David Powers, a tall man with a deep bass voice, placing a chair on the floor center front and calling all the children to him. Scott ran up to join in as he read Trina Paulus’ Hope For the Flowers to them in lieu of the sermon. Scott was mesmerized and ran back to his seat saying “we’re staying, aren’t we?” and, of course, we were! At the time of announcements, David asked if anyone would take home the frontal kit that had been purchased for Easter. 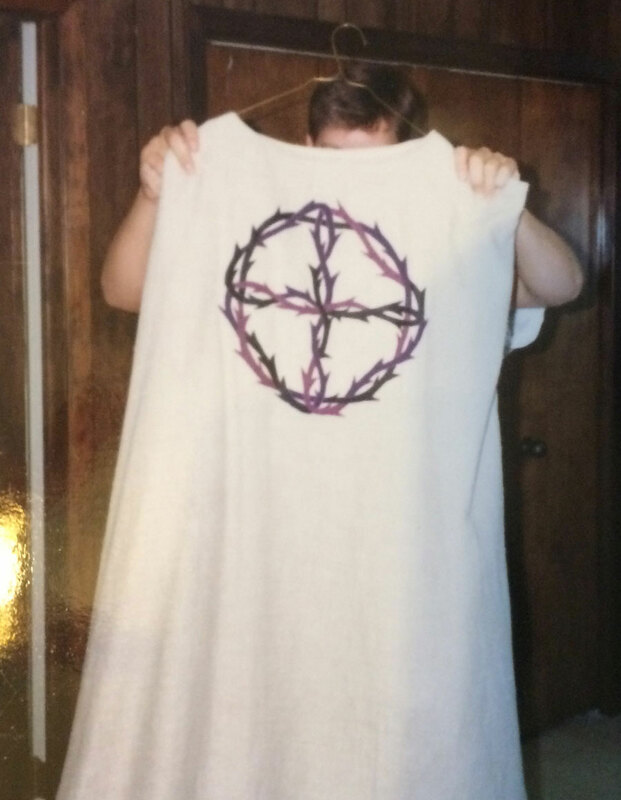 It was a fancy brocade with a large embroidered cross that had to be hand applied. I volunteered and they gave it to me. So it was the most unexpected and unplanned journey began. We joined St. Margaret’s and the children flourished. 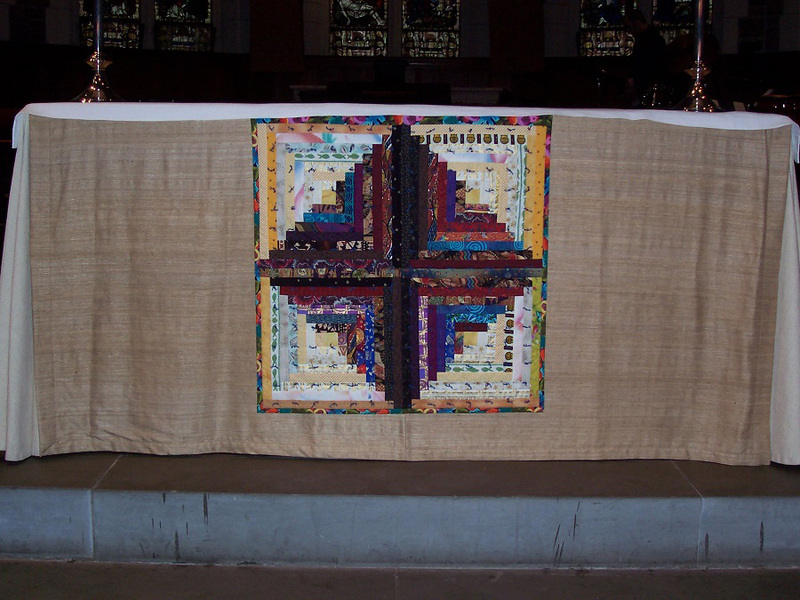 After a few months, I discovered how much the kit had cost and suggested we could have made it for a lot less ourselves to which David responded; “I’ve always dreamt of a Lenten set made of linen symbolic of the curtain torn asunder”. And I thought, why not? I have always sewn. Being the middle of three girls, if my mom didn’t make it, we didn’t wear it. She had little patience when we were young to teach us but my father collected little old ladies who became a part of our lives and I learned so many techniques at their knees from tatting to hucking to hand work and more. As we got older, mom taught us all about dress making. I am a Nurse by profession and soon discovered my drawing talents were far from acceptable. I must have drawn at least 70+ designs before I finally arrived at one I thought might be okay. When I showed David, his response was to say “great start”… not what I wanted to hear. I became quite ill but was recovering in time to go to the Verna Dozier Conference at a Retreat Center. Everyone was concerned for me and chose not to awaken me as I napped through one of the sessions. As I awoke, I remember quickly grabbing the envelope of my registration packet and sketching out what I saw. I was so pleased! It was in that moment that I came to know to wait and see what the Spirit had to say. Sometimes, I see things very quickly; other times, it takes much longer… but I always wait for the Spirit. As soon as we returned, I went to see David to show him. He was very pleased as well and said, “I see you added in a tear”. I said no, it isn’t a tear but a leaf. He told me I couldn’t have a leaf that this was a Lenten set… to which I responded it was Lent, I needed a leaf. We went around and around until the day the linen arrived and I told him I would be starting that afternoon. He stopped me and in his deep bass voice told me I could have my leaf “as long as it isn’t Kelly green”. I made the set. Serendipity stepped in as the first Sunday in Lent that year was St. Patrick’s Day. His whole sermon was about how most of us were wearing green and so was he; but we would have to look for it. That little leaf became the start of what would be Fruit of the Vine. 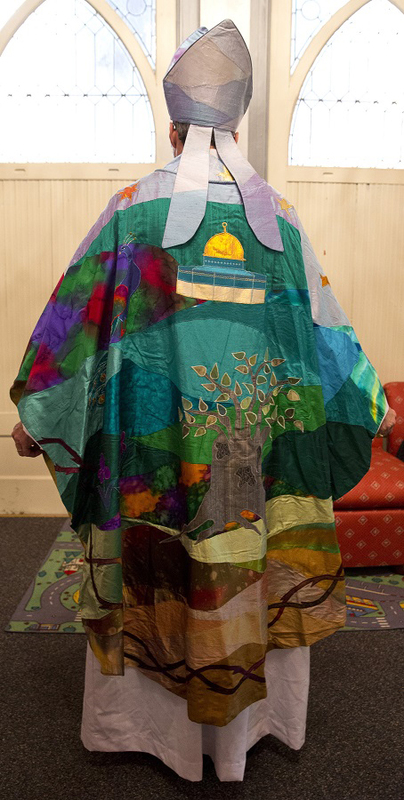 In the beginning, I never expected to have anything come of vestment making so my pictures are not so good. 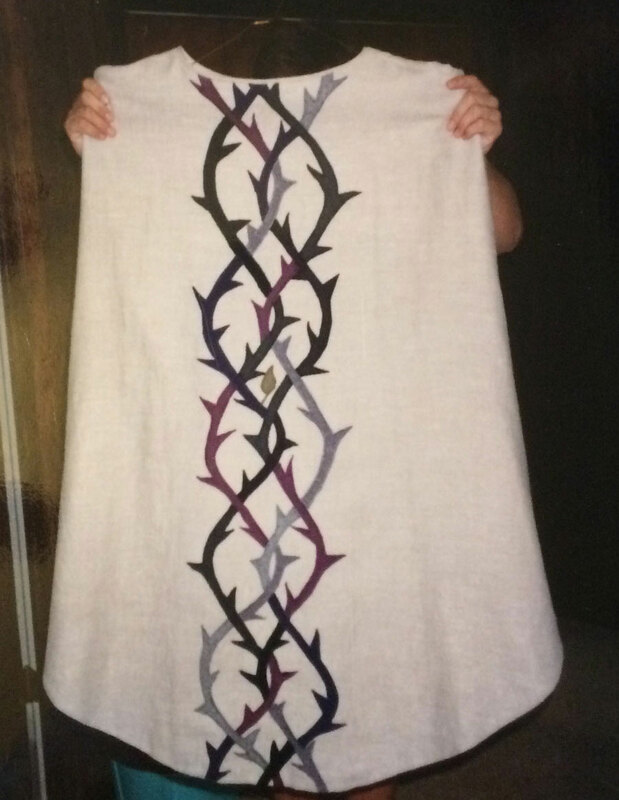 I created a contemporary Celtic knot of thorn vines for the back of the chasuble. The single green leaf grows toward the center. The front of the chasuble repeated the Celtic vine of thorns woven into the Crown of thorns with the Cross within. I used black, gray and purple fabrics for the vine and added in some red threads.